Puppy diarrhea isn't a fun subject to talk about, but it's so common that every puppy owner needs to know what it could mean, and how to deal with the problem. There are several possible reasons why little Rascal has diarrhea.... and several different types of diarrhea, each one giving clues to the cause. All of this can be confusing for puppy owners, and because loose stools in puppies can be an early symptom of some very serious dog illnesses it's important to know when you can afford to 'wait-and-see' (never for more than 24 hours) and when you need to make a trip to the veterinarian NOW. Although diarrhea in puppies is very common, that doesn't make it normal. Never ignore or discount it. If little Rascal's stools are soft, wet, liquid, watery, or they contain mucus and/or blood, there's a problem somewhere, and it's up to you to figure out where.. and why. 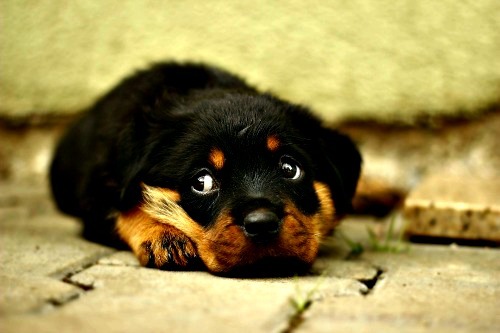 Which Illnesses Cause Diarrhea in Puppies? The most common diarrhea-causing illnesses in puppies are Canine Parvovirus, Coccidiosis and Giardia (the latter two are parasitic illnesses). Of the three, Parvo is the most dangerous and strikes the fastest, but left untreated both Coccidiosis and Giardia can also be very serious, even fatal. Intestinal worms can also cause diarrhea, and depending on the type of puppy worms Rascal has you MAY see them in his poop. So, how do you know if your puppy's diarrhea is being caused by an illness, infection, disease or worms? Simply look for accompanying symptoms. If your little Rascal is ill, chances are good he's going to have more than just diarrhea to show for it. The diarrhea may start off semi-solid but become progressively more liquid, eventually becoming very watery and may be explosive. Mucus in your puppy's stools indicate inflammation. Blood in puppy poop (may be red streaks or look like coffee grounds) indicates internal bleeding. Vomiting in puppies is like diarrhea in that it can indicate a variety of problems, some minor, some major. It generally needs evaluation by a veterinarian quickly. Your puppy may start by throwing up semi-digested food, repeatedly emptying his stomach until all that is come up is clear (possibly yellow or frothy) liquid. If your puppy has diarrhea and ANY other signs or symptoms of being unwell he needs to be seen by a veterinarian right away. Don't wait. Repeated, watery diarrhea accompanied by vomiting and/or lethargy could be Parvo. This disease can kill a puppy in 24 hours. Do NOT wait for your vet to open in the morning, find a 24 hour animal hospital or emergency veterinarian now. 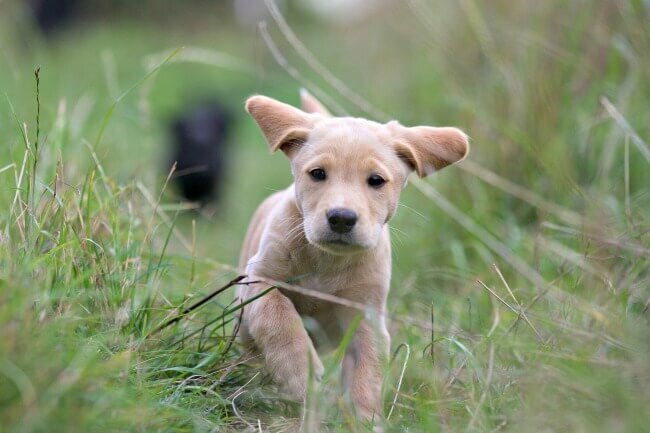 Coccidiosis and Giardia can also make a puppy very sick, very fast. Time is of the essence for a puppy with any of these conditions. Puppies are renowned for trying to chew, and swallow, just about anything. This can obviously lead to some health problems, including diarrhea, vomiting, constipation and even an intestinal blockage. If little Rascal has raided the trash can, eaten the cat's food (or been in the litter box), chewed up and swallowed a toy/sock/stick/rug/plastic bag/toilet paper... or any one of another gazillion random objects he may have come across... then he's likely to have an upset tummy. Soon. With luck, whatever he swallowed isn't toxic or dangerous and will pass through his digestive tract and come out the other end, but even in this best-case scenario some diarrhea and/or throwing is likely to be involved. Quite often you can see what caused the problem because pieces of it show up in his vomit or stools. Other times it's a bit of a mystery. The type of diarrhea you're most likely to see in this situation is of the soft, pudding-like variety. He may have the runs only once, or several times in a row. There may be some mucus in or around his poop if whatever he ingested irritated his intestines/colon but you shouldn't see blood. If you do, then little Rascal needs to see a veterinarian right away. Vomiting can happen. Again you may see pieces of whatever he tried to eat in what he brings up. If your puppy is repeatedly gagging/hacking/drooling or trying to vomit and seems distressed, anxious or unsettled he may have something lodged in his trachea or windpipe. If you think this has happened little Rascal needs veterinary help immediately. Finally, sometimes whatever a puppy has eaten is too big, or too heavy, to pass easily through the loops of intestine and bowel and gets lodged somewhere along the way. This is a veterinary emergency so get your puppy to your veterinarian immediately if you think he may have an obstruction, if it's after hours find a 24 hour pet clinic. Again, this could be a life-or-death situation. We all know the feeling... we're stressed, anxious or scared and suddenly our belly is cramping and we're wondering if there's a bathroom nearby! Stress, anxiety or fear has the same effect on animals, and puppies are no exception. If your pup has a bad or scary experience he might suddenly need to poop, or he may have diarrhea several hours later, or even the next day. 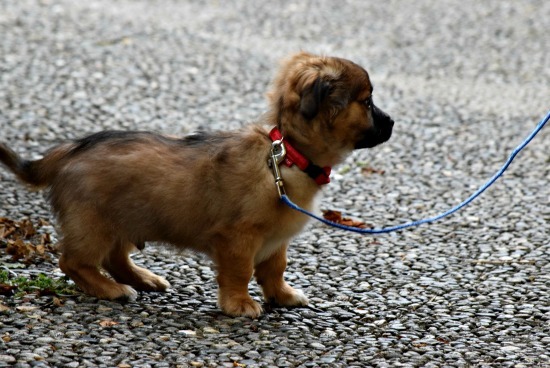 This type of diarrhea in puppies is usually of the soft, pudding-like variety and one or two loose stools is usually all that he (and you) will have to worry about. You might be wondering what could stress a puppy out, well quite a few things as it happens. Puppies are creatures of habit and routine, it's what helps them to feel safe and gives them confidence. Any sudden changes in their environment, routine, family unit and so on can cause anxiety and stress. Puppies are very intuitive and sensitive and if little Rascal's human family is feeling sad, anxious, stressed or angry, he'll absorb that emotion and it will affect him too. As you can see there are LOTS of things which might make your little guy anxious enough to get an upset tummy. Of course he'll adjust to any changes given a little time and lots of love, understanding and reassurance. If you think stress is what's causing your puppy to have diarrhea and other than some soft or slightly loose stools he seems healthy and is eating/drinking/acting normally then you can usually wait 24 hours or so to see if the problem resolves itself. But, if he seems ill in any way, the diarrhea happens repeatedly and gets worse, or he isn't back to normal within a day, have your vet take a look to make sure all is well physically. 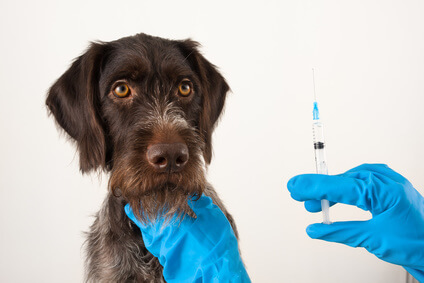 Can Puppy Vaccinations Cause Diarrhea? When puppy shots are given there's the potential for a whole range of side effects and adverse reactions. Diarrhea is actually one of the more minor puppy shots reactions that little Rascal could experience, and it generally isn't anything to be too worried about and doesn't last very long. But it's also possible for puppy diarrhea to be just one of several side effects your puppy experiences after being vaccinated. If Rascal shows any other signs of being unwell or you notice changes in his behavior, appetite, mobility or appearance, make sure you get him to your veterinarian for an exam to find out what's going on. Can Puppy Deworming Medication Cause Diarrhea? Again the answer is, yes. It's not unusual for a puppy who's been given a dewormer to have some diarrhea or vomiting. Puppy deworming medicines are pretty strong and because they're targeting parasites who live in little Rascal's digestive tract it's not surprising that they can cause digestive problems. Of course, worms themselves can cause diarrhea and/or vomiting, so your little guy could be getting a double-whammy. Heartworm preventatives can also cause diarrhea or vomiting, among other things. It's very common to see worms in your puppy's poop for several days after he's been given deworming medication. The drugs are killing the worms and they're then being flushed out of his body, in his stools. This is yukky, but it's what you're aiming for. As long as your puppy seems happy and healthy otherwise, and the diarrhea or loose stools don't become chronic (ie get worse and continue for more than a day) there's generally nothing to worry about. But as with all cases of puppy diarrhea, IF you see any other signs of illness in your puppy, he isn't drinking enough water, or there are behavioral changes which worry you, get him examined by a veterinarian right away. Once again, this cause of diarrhea in puppies happens because puppies usually want to chew/eat/drink anything they come in contact with. Learn more about all the things which are poisonous to dogs so you can keep little Rascal safe. There are a whole slew of different symptoms of poisoning in puppies and dogs, and diarrhea is just one of them. Others include vomiting, excessive drooling, internal bleeding, organ failure, seizures and more. The ASPCA Poison Control app is a handy way to make sure you always have the info. you need to keep Rascal safe at the touch of a button. If your puppy has diarrhea and/or other symptoms and you have even the slightest suspicion that he may have ingested something toxic, it's absolutely vital to get him veterinary help right away. Meanwhile call the ASPCA Animal Control Center at 1-888-426-4435 or 1-800-548-2423 or the International Animal Poison Control Center Hotline at 1-88-232-8870 for help/advice. This is always an emergency situation. If your pup has repeated diarrhea (with or without vomiting) he's at risk of getting dehydrated which can cause serious problems, potentially even organ failure and even death. Young puppies get dehydrated more quickly than adult dogs and may need IV fluids if they can't keep water down or are losing fluid in diarrhea and/or vomiting. 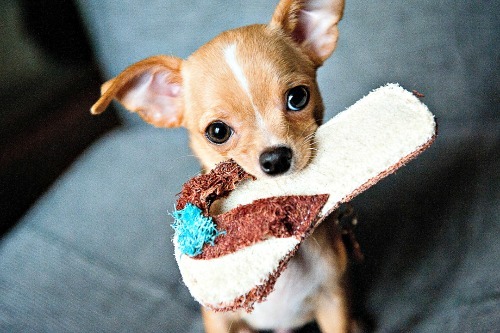 A quick check of your puppy's gums can give you an idea of whether or not he's in trouble yet. Healthy gums should feel smooth, moist and slick. 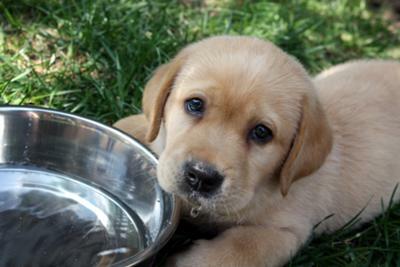 A puppy who is dehydrated will have gums which feel dry and rubbery. Your finger won't slide across them easily. This is serious and little Rascal needs to be examined by your veterinarian right away. 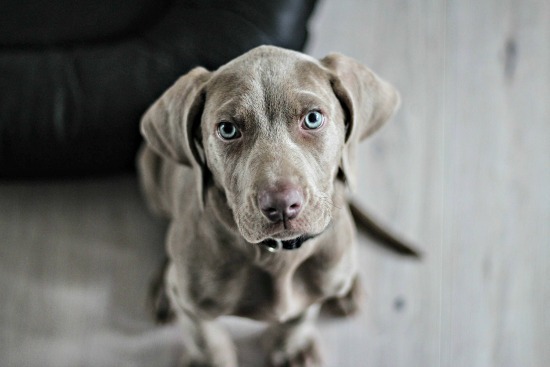 Home › Puppy Health › Why Does My Puppy Have Diarrhea?